Cloud computing is fundamentally shifting the enterprise network from fixed, data-centric, server technologies to a flexible, application-driven, dispersed network that aligns more closely to business needs. Today, the adoption of cloud computing is enabling companies around the world to be successful despite their size and existing technology infrastructure. 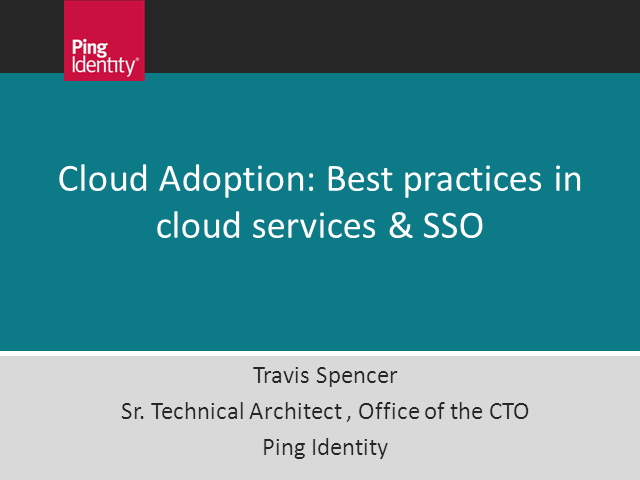 In this presentation, Travis Spencer, a Sr. Technical Architect in Ping's CTO office, will review lessons learned from the hundreds of Ping Identity customers who have implemented cloud identity strategies. Travis Spencer is a Senior Technical Architect reporting to Ping Identity's CTO. He has over a decade of application development experience which includes the design of large-scale service-oriented and federated systems. His experience federating SaaS offerings with some of the world's largest financial institutions coupled with his low-level understanding of federation protocols (e.g., SAML, WS-Trust, and WS-Federation) has allowed him to help numerous companies successful begin using cloud computing. His knowledge of OpenID and OAuth also provides him with a unique perspective on the relationship between enterprise- and consumer-grade digital identity management.